Machine learning is an artificial intelligence approach that lets a computer learn from new data, updating its own results as it receives new information—allowing it to predict what might happen next. Los Alamos National Laboratory researchers are using machine learning in everything from forecasting earthquakes to exploring astrophysics and geoscience. To maintain U.S. supremacy in AI, the best way forward is to adopt a strategy hewing more closely to the way humans learn, putting us on the best path to the benefits promised by full-fledged artificial intelligence. To maintain U.S. supremacy in AI, the best way forward is to adopt a strategy hewing more closely to the way humans learn, which will put us on the best path to the economic growth and widespread social benefits promised by full-fledged artificial intelligence. Here’s the challenge with most deep learning neural networks, which reflect the prevailing approach to AI: calling them both deep and intelligent assumes they achieve ever more abstract and meaningful representations of the data at deeper and deeper levels of the network. It further assumes that at some point they transcend rote memorization to achieve actual cognition, or intelligence. But they do not. Consider computer vision, where deep neural networks have achieved stunning performance improvements on benchmark image-categorization tasks. Say we task our computer vision algorithm with correctly labeling images as either cats or dogs. If the algorithm correctly labels the images, we might conclude that the underlying deep neural network has learned to distinguish cats and dogs. Now suppose all of the dogs are wearing shiny metallic dog tags and none of the cats are wearing cat tags. Most likely, the deep neural network didn’t learn to see cats and dogs at all but simply learned to detect shiny metallic tags. Recent work has shown that something like this actually underpins the performance of deep neural networks on computer vision tasks. The explanation may not be as obvious as shiny metallic tags, but most academic data sets contain analogous unintentional cues that deep learning algorithms exploit. Using adversarial examples, which are designed to foil neural networks, adds even more disturbing evidence that deep neural networks might not be “seeing” at all but merely detecting superficial image features. In a nutshell, adversarial examples are created by running in reverse the same computational tools used to train a deep neural network. Researchers have found that adding very slight modifications to an image—imperceptible to humans—can trick a deep neural network into incorrectly classifying an image, often radically. The problem, it turns out, is one of computational misdirection. Adding or deleting just a few pixels can eliminate a particular cue that the deep neural network has learned to depend on. More fundamentally, this error demonstrates that deep neural networks rely on superficial image features that typically lack meaning, at least to humans. That creates an opportunity for serious mischief by bad actors using targeted adversarial examples. If you’re counting on consistent image recognition for self-driving cars designed to recognize road signs, for example, or security systems that recognize fingerprints … you’re in trouble. This flaw is built into the architecture. 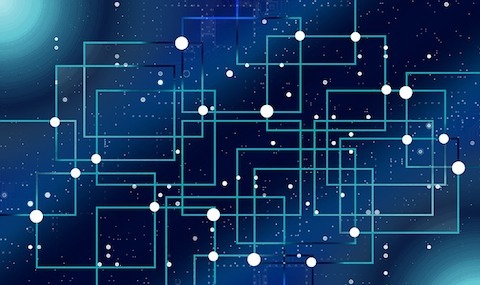 Recent research in Israel led by Naftali Tishby has found that a deep neural network selectively drops non-essential information at each layer. 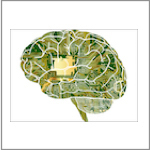 A fully trained deep neural network has thrown away so much information and has become so dependent on just a few key superficial features—“shiny metal tags”—that it has lost all semblance of intelligence. Deep learning is more accurately described as deep forgetting. Even more damning, deep neural networks exhibit no capacity to learn by analogy, the basis of all intelligence. For example, humans and other animals use analogy to learn that the world consists of objects that possess common attributes. Whether it’s a rock, an apple or a baseball, all such objects fall to the ground because they obey the laws of an intuitive physics learned during the development of intelligence. Researchers at Brown University recently tested whether deep neural networks could learn by analogy. The team found that neural networks failed to learn the concept of sameness. Instead of learning by analogy the underlying concept linking the examples of similar images in a training set of images, deep neural networks simply memorized a set of templates for correctly labeling the images in the training set. The networks gained no capacity to generalize outside the training data. It is difficult to imagine a more searing indictment of deep learning than the inability to learn by analogy. Essentially all cognitive development rests on learning and abstracting the principles underlying a set of concrete examples. The failure, thus far, of deep learning to do so reveals the emptiness behind the facade of intelligence presented by current A.I. systems. By jumping over the long, slow process of cognitive development and instead focusing on solving specific tasks with high commercial or marketing value, we have robbed AI of any ability to process information in an intelligent manner. This story first appeared in Scientific American. Researchers are simulating biological neural networks on supercomputers, enabling machines to learn about their surroundings, interpret data and make predictions. Garrett Kenyon is a computer scientist specializing in neurally inspired computing in the Information Sciences group at Los Alamos National Laboratory, where he studies the brain and models of neural networks on the Lab’s high-performance computers. Other members of the sparse prediction machine project were Boram Yoon of the Applied Computer Science group and Peter Schultz of the New Mexico Consortium. This story first appeared in Discover. By listening to the acoustic signal emitted by a laboratory-created earthquake, a computer science approach using machine learning can predict the time before the fault fails. “At any given instant, the noise coming from the lab fault zone provides quantitative information on when the fault will slip,” said Paul Johnson, a Los Alamos National Laboratory fellow and lead investigator on the research, which was published today in Geophysical Research Letters. Machine learning is an artificial intelligence approach to allowing the computer to learn from new data, updating its own results to reflect the implications of new information. The machine learning technique used in this project also identifies new signals, previously thought to be low-amplitude noise, that provide forecasting information throughout the earthquake cycle. The paper: "Machine learning predicts laboratory earthquakes" Geophysical Research Letters. 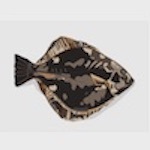 How flounders (yes, the fish) can help national security Los Alamos National Laboratory researchers have developed an algorithmic framework to study camouflage in nature to learn how to identify things trying to disguise themselves. Thayer was right. Nature uses both blending and patterns to disguise itself. And it is exceedingly good at it. If you have any doubts, just watch this video of an octopus seamlessly blending in to its surroundings. Over the last hundred-plus years, humans have looked to nature to improve our ability to camouflage ourselves. We’ve come a long way. Lakshman Prasad is a data scientist in the Intelligence and Space Research division of Los Alamos National Laboratory. His most recent paper on this topic can be found in the journal Methods of Oceanography. LOS ALAMOS, N.M., May 9, 2016—Researchers recently demonstrated how an informatics-based adaptive design strategy, tightly coupled to experiments, can accelerate the discovery of new materials with targeted properties, according to a recent paper published in Nature Communications. 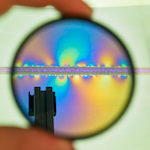 “What we’ve done is show that, starting with a relatively small data set of well-controlled experiments, it is possible to iteratively guide subsequent experiments toward finding the material with the desired target,” said Turab Lookman, a physicist and materials scientist in the Physics of Condensed Matter and Complex Systems group at Los Alamos National Laboratory. 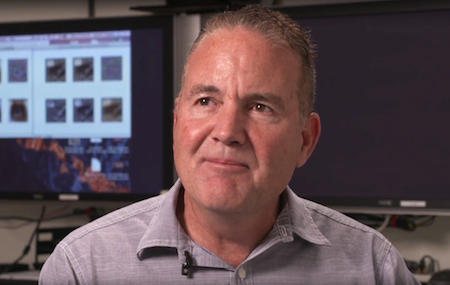 Lookman is the principal investigator of the research project. “The goal is to cut in half the time and cost of bringing materials to market,” said Lookman. 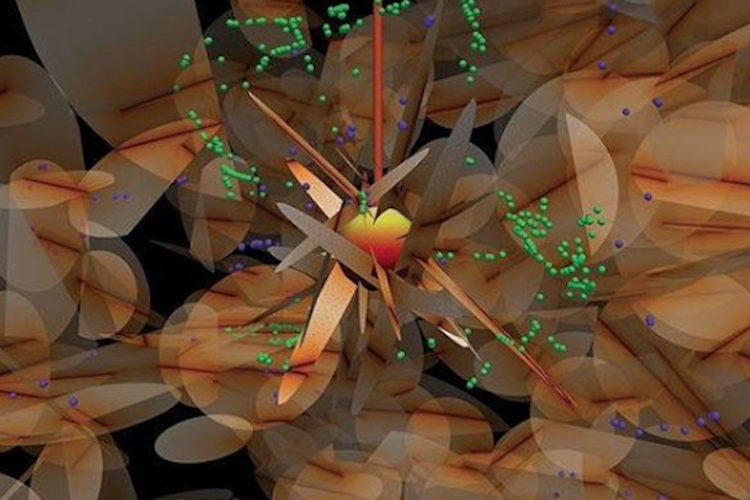 “What we have demonstrated is a data-driven framework built on the foundations of machine learning and design that can lead to discovering new materials with targeted properties much faster than before.” The work made use of Los Alamos’ high-performance supercomputing resources. Lookman and his colleagues focused on nickel-titanium-based shape-memory alloys, but the strategy can be used for any materials class (polymers, ceramics or nanomaterials) or target properties (e.g., dielectric response, piezoelectric coefficients and band gaps). 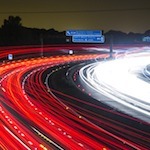 This becomes important when experiments or calculations are costly and time-consuming. Although the work focused on the chemical exploration space, it can be readily adapted to optimize processing conditions when there are many “tuning knobs” controlling a figure of merit, as in advanced manufacturing applications. Similarly, it can be generalized to optimize multiple properties, such as, in the case of the nickel-titanium-based alloy, low dissipation as well as a transition temperature several degrees above room temperature. The work supports the Lab’s Nuclear Deterrence and Energy Security mission areas and the Information, Science, and Technology and Materials for the Future science pillars. Exploring the physics, chemistry and metallurgy of materials has been a primary focus of Los Alamos since its founding. Through the exploration of materials, Los Alamos pursues the discovery science and engineering required to establish design principles, synthesis pathways, and manufacturing processes for advanced and new materials to intentionally control functionality relevant to the Lab’s national security mission. Lookman and coauthors Dezhen Xue, Prasanna V. Balachandran, John Hogde, James Theiler, and Deqing Xue published their research in an article titled “Accelerated search for materials with targeted properties by adaptive design,” which was published in the April 15 issue of Nature Communications. 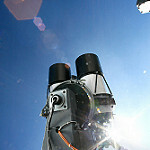 Los Alamos National Laboratory’s robotic thinking telescope system, RAPTOR, checks gamma ray sources and photographs blazars as it roams the skies. This story first appeared in Huffington Post. Designed to provide increased computational capability, the Trinity supercomputer performs 41.5 million billion calculations per second. Every night, a bank of robotically controlled telescopes tilt their lenses to the sky for another round of observation through digital imaging. By listening to the acoustic signal emitted by a laboratory-created earthquake, machine learning can predict the time remaining before the fault fails. 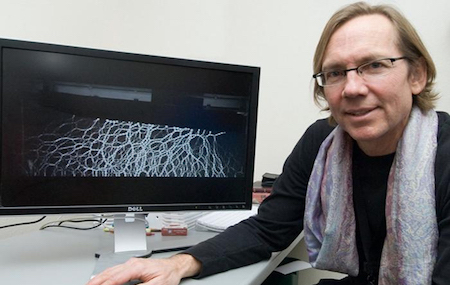 Researchers are developing computers that simulate neurons and their interconnections. 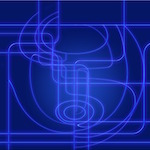 Then computers can learn, interpret data, and make predictions. 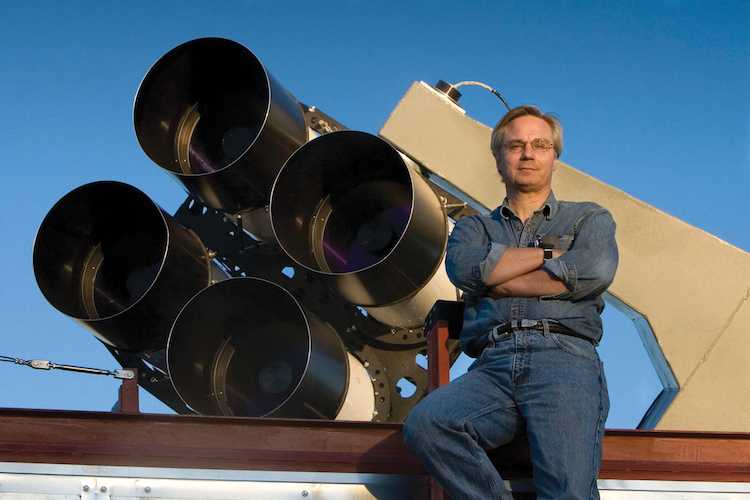 Tom Vestrand poses with RAPTOR-T, four coaligned telescopes with insertable color filters. Geoscientists are training computers to learn from a wide range of geologic data. Kenyon is a computer scientist specializing in neurally inspired computing in the Information Sciences group at Los Alamos, where he studies the brain and models of neural networks on the Lab’s high-performance computers. 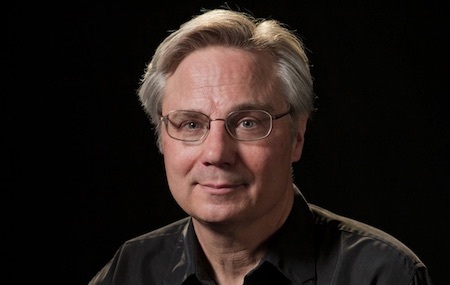 Johnson is a geophysicist, Los Alamos National Laboratory Fellow, a Fellow of the Acoustical Society of America, and an American Geophysical Union Fellow in the Laboratory’s Geophysics group. He applies machine learning to earthquake source mechanics. Prasad is a data scientist in the Intelligence and Space Research division of Los Alamos National Laboratory. Using machine learning, he studies camouflage in nature to learn how we can identify things trying to disguise themselves. Vestrand is in Los Alamos’ Space and Remote Sensing group. He works to develop fully autonomous “thinking telescopes” that utilize machine learning to catch gamma-ray bursts.